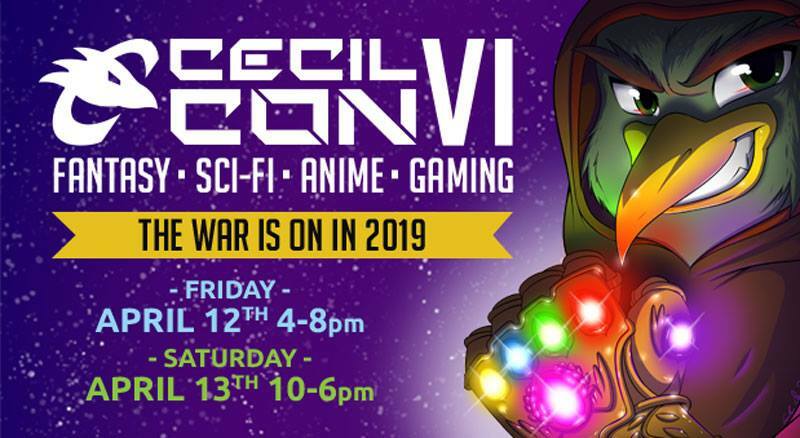 Cecil Con 2019 is here! I will be at Cecil Con tomorrow – with bells on! Look for me in the artists’ alley – table 15. Come on and get your Con on! 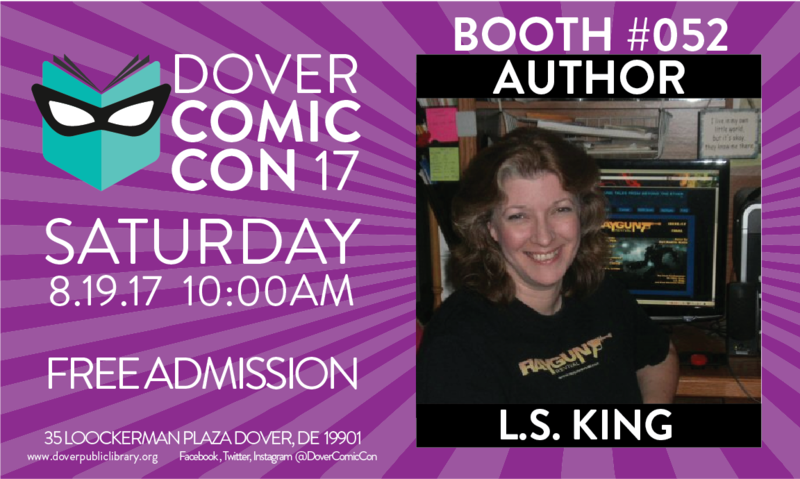 Ocean City Comic Con – this Saturday! Lots of comics, artists, authors (including meeeee! ), cosplay, the TARDIS, a DeLorean, and more! Dover Comic Con and new books in my series! 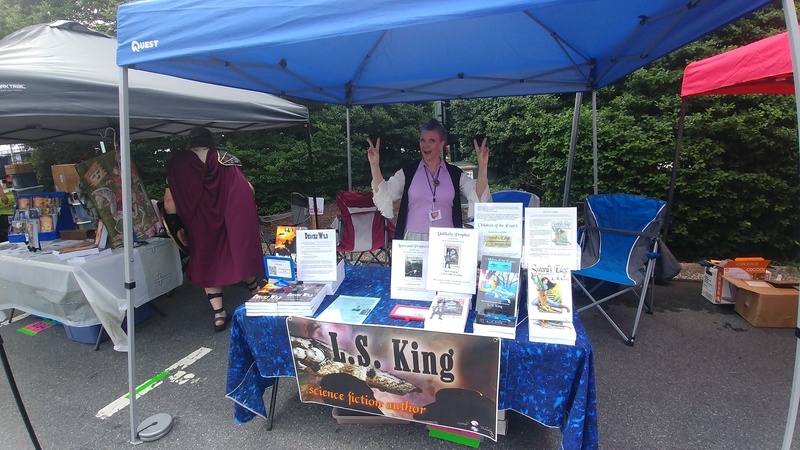 Tomorrow is Dover Comic Con, and I’m thrilled to have two new books in the Sword’s Edge Chronicles to offer at my table! For those who aren’t close enough to attend (and if that’s the case I’m sorry, I’m so sorry), you can still snag the two new titles, or if you perhaps haven’t started the series yet, now is the time, because the fourth book in that series is due out this fall. You can get the first book, Sword’s Edge, online in print or ebook (in lots of different formats). The two new books of the series are (in published order): Children of the Enaisi, which continues hard on the heels of the first book, Sword’s Edge, and book three, entitled Unlikely Prophet, a prequel which takes place 1,000 years in the past, and adds to the depth and understanding of their world. Book four, Laws and Prophecies, as I said will be out soon. And in case swords, capes, castles, aliens, portals, bio-tech, and telepathy aren’t your thing, I also have two novels in a space opera series: Deuces Wild. It’s about a cowboy and a space pirate. Or is he a mercenary? Or an assassin? Perhaps you’ll figure it out. I’m Ready for Ocean City Comic Con! My website’s Events page has been updated to reflect that I will be beamed up to Ocean City Comic Con on 8 Dec 2018. Anyone want to volunteer to be a minion since mine is moving away this summer? Dover Comic Con 2017 Was the Best Yet! Arise, arise, Fandoms of Comic Con! Fun deeds awake: LARP and laughter! a geek-day, a hot day, ere the sun rises! Ride now, ride now! Ride now to Dover! Yesterday was the most amazing Dover Comic Con yet! If I’ve forgotten anyone, I’m sorry, but I came home and collapsed almost immediately and slept for over twelve hours straight. I’m still not totally awake and coherent. The panel on “What an Editor Wants” was fun – lots of folks showed up. I hope I didn’t frighten them, because that wasn’t my intent. But the business is so cutthroat, I wanted to emphasize that you must be on your best game, and be as professional as possible. Will Hahn co-hosted with me, and I think he un-scared them after I got finished terrorizing them. I’m uploading the cosplay photos to my FB author page, and I apologize because I didn’t get lots of pics because my booth was so busy! I had some few run up with gasps or squeals and saying, “Is that book two?” about Deuces Wild: Stacking the Deck (one man marched over, picked up Stacking the Deck and held it high, and huffed, “FINALLY!” I told him book three was already being written, to which he replied, “Good!”), and others who were groaning because the sequel to Sword’s Edge wasn’t yet released. I made sure they either took a business card or took advantage of the QR code for my website so they could keep up with news about the release of the sequel. A few even slowed walking past and called out to the effect of, “I have her books, they’re great! Can’t wait for more!” as folks were huddled at my booth. It’s a strange but fantastic feeling to know you’re an author with fans, and that they’re eagerly awaiting more stories! Dover Comic Con in Just Two Days! Fun day with My People! I still don’t know what my cosplay will be. Ideas, anyone?